I imagine that it is not every day of the week that a young boy is beaten by a mayor on top of a mountain! But before you start to reach for your telephone, please be re-assured, no children are harmed in this ceremonial event (apart from a few sore feet perhaps). No, this now purely symbolic assault on a young lad takes place during the annual August re-enactment of an ancient tradition – the perambulation, or ‘beating’ of the bounds of the Barony of Newport, our local town. These ceremonial perambulations ceased in 1888 and it was not until 1964 that the custom of beating the bounds was revived in Newport. The full circuit is about 26 miles but nowadays a slightly shorter route has been adopted. So each year a band of walkers and horse-riders congregate in the town square in order to follow the Barony flag for a (mere) 9 mile ‘perambulation’. Heading off first along the beautiful, rugged coast path, the group then climb up through ancient lanes and fields to the wilds of Waun Fawr common. It is at the Bedd Morris boundary stone that some poor unsuspecting youth is ceremonially beaten by the Mayor and the perambulators are offered ‘cakes and sweetmeats’. 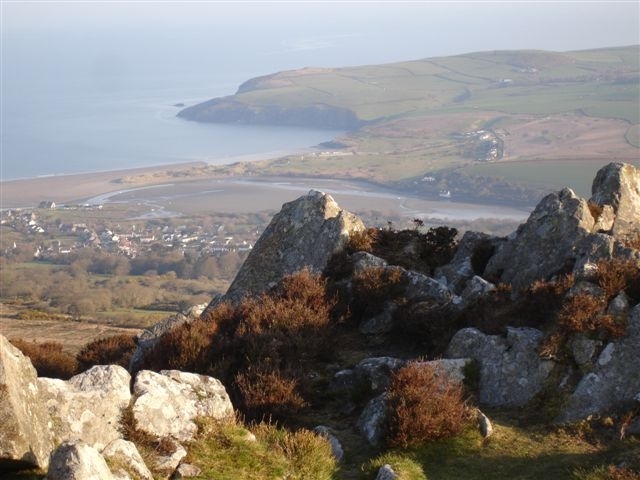 Thus refreshed, the party then heads on up over the remote heather, gorse and sheep covered hillside to patrol the boundary behind the dramatic crags of Carn Ingli (Mountain of Angels – the location of one of the key scenes from my novel SLICK DEALS), and finally back to Newport. Everyone who completes the circuit is rewarded with a Certificate presented by the Court Leet (a body of ‘Burgesses’ and ‘Aldermen’ who traditionally serve the Newport Barony). Participants also take away an abiding memory of a walk (or ride) undertaken with a sense of purpose and of being part of living history. 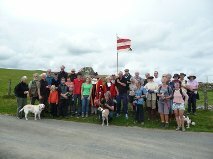 Last year about 35 walkers, a dozen or so riders and a selection of dogs successfully ‘beat the bounds’ on a particularly lovely August day. If you are in the Newport, Pembs area do join us this year. We will meet in Market Square at 1 pm on Friday 17th August. Young boys are especially welcome!